Simple yet delicious mashed Avocado toast is going to the 3rd day of BM 55 under the theme Kids Delight Event - Healthy Breakfast. Avocado has been our favorite since almost 4 yrs now. I usually make Guacamole with it, have also tried adding the mashed avocado to wheat flour to make roti but kids didn't like it much. Next tried adding this as a spread onto toasted bread. Kids started liking this after a while. Slowly started adding a plain omelet to the toast and it has become our family favorite now. At least twice a week Avocado Toast is been made in my kitchen. Left over guacamole also works best for the toast, if not simply add salt and lime juice to mashed avacado and spread it on the bread. Add very little chili flakes to give it a slight kick to the toast. Here goes the simple and delicious Avocado Toast for the final day of BM 55. Today am here with a Dosa Variety, which is healthy for kids as well as for grownups. Ragi is commonly known as Finger Millet, it can be ground and cooked into cakes, pudding, dosa and many more varieties. Finger millet is very high in Calcium, rich in iron and fiber and has a better energy content than any other cereals which makes it ideal for feeding infants and the elderly. In southern part of India, pediatricians recommend finger millet / Ragi for the infants of 6 months and above because its high nutritional content. Home made ragi -malt is a popular infant food. 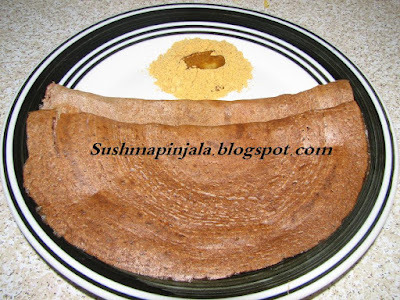 Now as my kids are grown up, I have tried making dosa with the ragi / finger millet flour. This .recipe goes to the 2nd day of BM 55 under the theme Kids Delight- Healthy breakfast. Having a healthy breakfast is a good start of the day and it is the most important meal of the day. Today we are starting with 4th week of BM 55 and my theme for the week is Kids Delight - healthy breakfast. Don't know how fussy your kids are but my kids very fussy in the mornings to have their breakfast. Often they have milk and cereal or a simple bread and jam or a boiled egg for the breakfast. Sometimes they skip everything and just have a glass of milk. On a hottest day, nothing seems interesting and refreshing than a icy pop or a Popsicle. A frozen treat which is favorite of grown ups and little ones. Why to get from a store when you can make them right in your kitchen with what ever flavor you want. Blend everything and fill the molds and freeze them, as simple as that. For day 3 under the theme "Nutella Galore", am here with the delicious Nutella Popsicle. You can replace regular whole milk with almond milk. Fill the popsicle molds with the blended mixture. Freeze it over night or for at least 10 to 12 hours. Let the molds stand in hot water for few seconds to serve. Check to see what my fellow bloggers are cooking for BM 55. Its summer time in USA, kids are home and moms are busy thinking how to keep them busy. If you do not keep them busy they will try to keep you busy, hahahahha. Every 1/2 hour they are hungry and keep asking for snack. Today I made them make their own cookies. They were more excited when I said "we are gonna make chocolate chip cookies with nutella". My daughter was all set with her spatula and whisk. Yes, for day 2 under the theme "Nutella Galore", I made chocolate chips cookies, with a surprise ingredient which you can find when you just take a small bite of it. You heard it right, nutella in a cookies, which makes the chocolate chips cookies more delicious than before. Here goes the recipe for delicious and melt in mouth soft cookies with the goodness of nutella. Do you like chocolate? Who doesn't like chocolate, specially kids. My kids love chocolate in any form. Specially my daughter who is a big fan of Nutella. Nutella is a delicious Hazelnut spread which contains skim milk and cocoa. Today we are starting with 2nd week of BM 55. My theme for the week is "Nutella Galore".And for day 1 am here with Nutella Hot Chocolate, which is perfect drink for kids and chocolate lovers. My son loves hot chocolate from Starbucks. So on his demand here is the Hot Chocolate with yummy Nutella. In a pan add milk, nutella and stir it while the heat is on. Once the nutella is well incorporated in milk add vanilla extract and give it a stir. Boil the milk for 5 to 8 minutes and switch of the flame. Transfer the milk in to serving cup / glass. Garnish with whipping cream and chocolate chips.